Particulates in your flume/wash system will consume chlorine, degrade, taste bad, and clog up your chiller system so they don’t perform efficiently. The Water Filtration System is designed to remove particulates from water down to 200 microns. 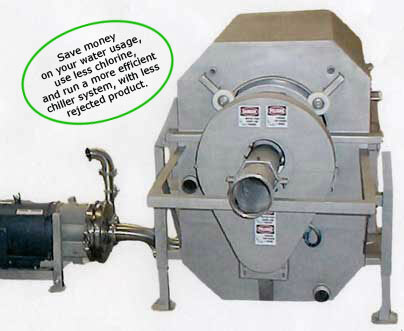 It allows reuse of water at a high volume rate with less chlorine use and gives a cleaner, better product. Available to handle from 200 GPM to 1500 GPM. Can be installed-easily either gravity or pumping system. It is known that particulates in your flume/wash system will consume chlorine, degrade taste and clog up your chiller systems so they don't perform as efficiently. Now you can filter the water down to 200 microns with less chlorine and get a cleaner, better product. Can be installed easily either gravity or pumping system.